Solid Signal’s SATLOOKLITE meter is the best solution for a tailgater or enthusiast who wants an easy way to align a dish quickly. It’s packed with features, but it’s also easy to use. If you haven’t read all about it, take a look at our review. 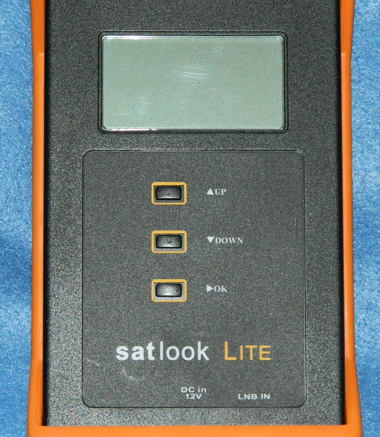 This tutorial will show you how to use the SATLOOKLITE to get TV on game day or when you’re out camping. But first a little disclaimer… This tutorial is designed to get you up and running quickly. If you’re permanently mounting a dish and doing your home theater install, you’ll want to take a lot more time to get everything just right. The SATLOOKLITE meter can also be used for a permanent installation using the same steps… just take a lot more time to make sure that everything is perfect and properly grounded. indicating that the meter is charging. If you don’t see this display, or if the meter boots up by itself, that could be an indication that the battery got loose in shipping. Carefully remove the orange rubber bumper, open the battery hatch on the bottom and check for a tight connection. If you don’t have time to wait for the meter to charge, you can press the OK button to move straight to aligning your dish, but you’ll need the meter to be plugged in the whole time. Start by assembling the dish and mounting it on your tripod or mast. It is EXTREMELY important that the dish be as plumb and level as possible. Don’t rely on a smartphone level for this or even the internal leveling bubble. Fine-tune the mounting with a box level. If you don’t have one, your local home improvement store is a great place to look for this. Get the longest one you can so it is as accurate as possible. You’ll need to aim at the DIRECTV 101 satellite, which sits a few hundred miles south of Austin Texas and 22,000 miles up. The dishpointer app or web site should help you find the exact settings. Start with the azimuth, which is the compass heading of the dish. At this point if you’re using a Slimline dish it’s also a good idea to set the elevation (up and down) and tilt (rotation of the dish so that one side is lower than the other. You can fine tune these later as necessary. Turn on the meter by pressing and holding the OK button. After it initializes, it will go straight to the Satellite Search screen. If you have already used the meter, it will go back to the last satellite you were searching for. If that’s not the 101 satellite, scroll up or down using the up and down buttons. For conventional dishes like the round DIRECTV dish or the non-SWM Slimline Dish, you should be looking for DTV Slimline 101W. 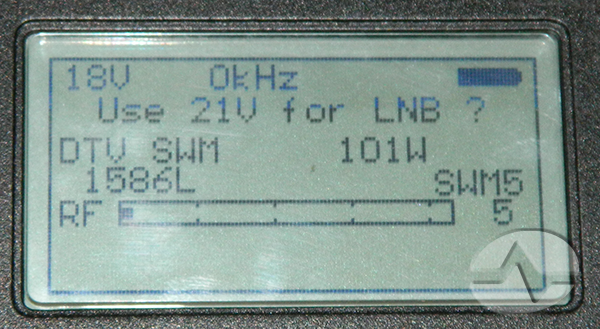 If you are using a SWM-enabled dish, you will see a message “Use 21V for LNB?” This is just a warning that the meter will put 21 volts out to power the SWM. You can do this for up to half an hour. 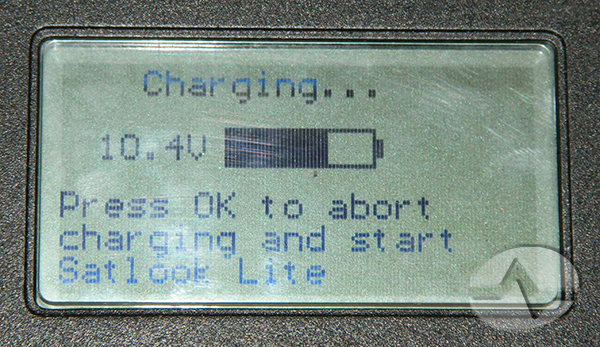 There is no way to turn off the voltage setting, this is just a warning. In general, you will be connecting straight from the dish to the meter, but if you are using a splitter, make sure the meter is connected to the red power-passing port on the green-label splitter. Press OK to make the message go away and start testing. If for any reason you feel you do want to operate the meter without using the power function, connect it to one of the NON-RED ports on a green-label splitter and it will block the voltage for you. If you’ve aimed the dish correctly (and if you’re lucky) the meter should lock on the 101 satellite and you’ll see something like the image above. If you don’t find the satellite right away, rotate the dish on the mast (in other words, move it left and right) slowly until you lock in. Then move the dish in ever smaller steps to get the best signal. RF: After locking it, this will drop to a level generally below 25. The documentation’s kind of weak here but it seems to be the signal level in dBmV. Subtract 48 to get the signal level in dBm, which is probably what you’re used to. In this case the signal is -29dBm. S: This is the signal level in dB above the noise floor. This should be as high as possible but don’t worry too much about it unless it’s really low, which could indicate a bad cable. Q: This is really what you should be looking at. It’s similar to the built-in signal meters in the receivers and gives you a number between 0 and 100 that shows the quality of the signal. Higher is better. Take some time to get that Q number as high as possible. Don’t worry if it’s not 100, because it probably won’t be. On a sunny day you’ll be fine with anything above 70, but the higher it is, the better all your satellites will be. If you’re using a round dish, tighten everything up! You’re done! Now go enjoy the game! If you’ve set elevation and tilt properly you should be getting some signal on the satellite you’re listening for. From here make very small adjustments to fine-tune what you’re seeing. The Slimline-3 is much easier to aim because the three satellite locations it uses are much closer together. Getting that 119 satellite to lock in can take a little time. Once you have the farthest satellite locked in, the others should be strong enough that you should be able to tighten everything down. Aiming the SWM dish can be a little more confusing. The dish only gives you signals for 101 and 119. 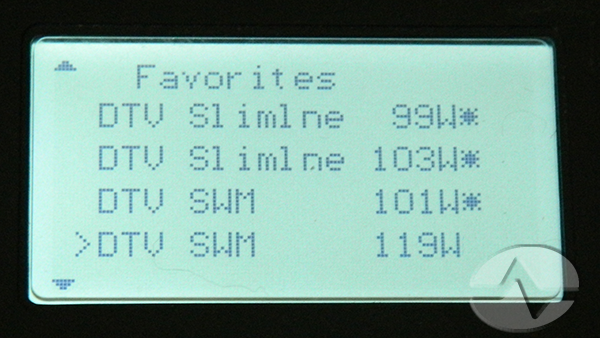 You can’t use the DTV Slimline settings to fine-tune a SWM dish. 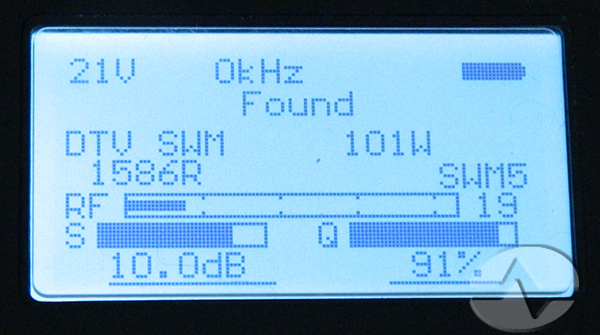 If you have the Slimline-5 with SWM, you should get some signal on SWM 119 and this will let you fine-tune the tilt and elevation. If you have the Slimline-3 with SWM, it gets tricky. This dish may give you a false reading on SWM 119. You should ignore this, it’s just reading the 101 satellite. 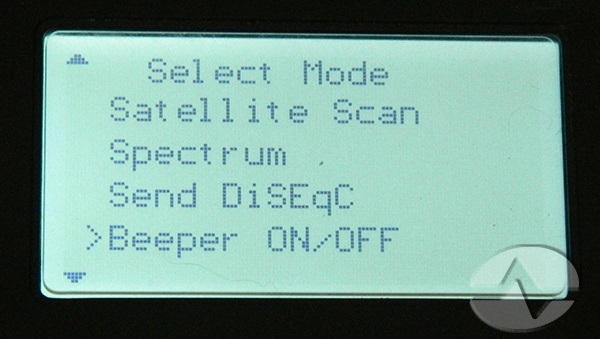 Since you can’t read the signal from the 103 satellite, you have to rely on those dishpointer settings. Slimline-3 dishes don’t need as much tilt setting so once you’re dialed into the 101 satellite and you’ve rough-set the tilt it should work. 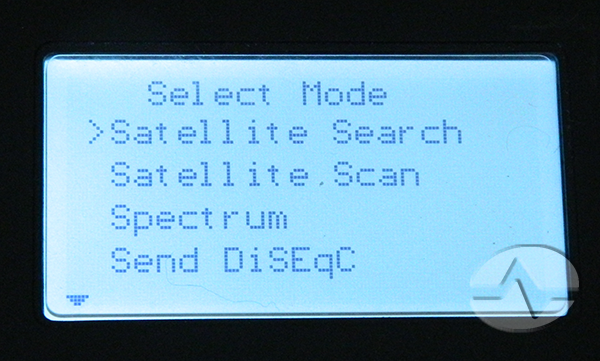 If you’re not getting strong enough signal on the 103 satellite, you can use your DIRECTV receiver to get signals from the 103 dish and fine tune from there. However, this will be a little slower than using the meter. 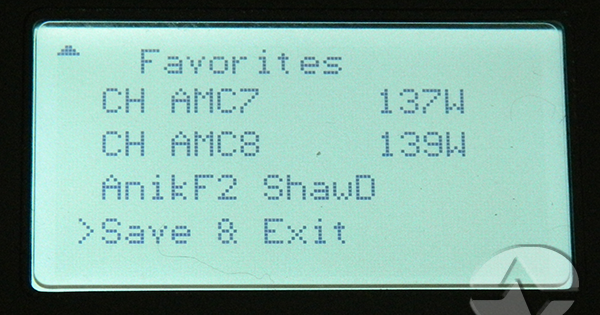 You’ll note that the display will read SWM5. That’s ok even if you have a Slimline-3 dish. You can go into the menus and make it read SWM3 but it won’t make it any easier to aim. Once you’re done aiming, tighten everything up and run the cable for your power inserter and receiver. Remember that DIRECTV SWM dishes do need the power inserter. There are a lot of settings in this meter and honestly there’s no need to go into them. You should specifically avoid the LNB Setup Menu unless you are using this meter to align a dish that’s not in its memory. Highlighting this option and pressing OK will make the beeping stop. If you’re having trouble aiming, people around you will thank you for doing this. The Favorites option lets you hide dish types that you don’t care about. In general you will want to hide everything but the dish type you are actually using. Use the up and down buttons to highlight a dish type then press OK. If there is an asterisk (*) next to a dish, that means it will appear in your favorites. If the asterisk isn’t there, you won’t see that dish when you scroll up and down while searching for satellites. When you’re done hiding all the dish types you don’t want, arrow down to Save & Exit and press OK. Then arrow up to Satellite Search and press OK. 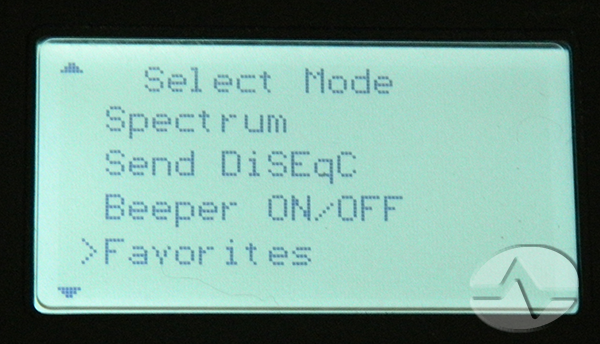 Most options will reset themselves after the meter is turned off and on. The only one that sticks is the Favorites list. To turn the meter off, press and hold the OK button. If the meter is plugged in, unplug it, turn it off by pressing and holding the OK button then plugging the meter in. Aiming a dish takes time to get right. Chances are it’s going to take a long time the first time you do it. If you’re planning on tailgating, you might want to do a practice run at home before setting up in the parking lot on Sunday. Go through the process several times and learn how the meter will respond. The most important thing you can do from the very beginning is to level and plumb the dish. All your measurements will be off if the dish is not level and plumb. There’s a tendency to breeze through this part but make sure you take plenty of time to level the dish as well as possible. It will make everything easier. Remember, make tiny movements. A movement of 1/32″ can mean you’re pointing 700 miles away from your target. Tiny tiny movements will help you get zeroed in. One of the easiest mistakes to make is zeroing in on the wrong satellite. Make sure you’re aimed where it tells you for the 101 satellite, because it’s easy to aim at the 119 satellite instead and the meter will not always know the difference. When you’re done, tighten everything down as best you can and secure the tripod with sandbags or bricks. You don’t want it blowing over in the wind. Above all, especially if you’re tailgating, know when it’s ok to say “all done.” You don’t need to chase that 100% signal level, because you’ll never get it. It’s a good idea to get above 90 on the 101 satellite but don’t sweat it if your numbers are in the 70s — as long as you’re getting good picture you’ll be fine. This is a temporary installation and as long as it works on Sunday you’re fine. We’ve produced a video showing this meter in action! Check it out!